That point was reaffirmed recently as the Michigan State University team finished third among 24 college teams in the prestigious National Team Selling Competition (NTSC), hosted by Indiana University on Oct. 10-12. “While we weren’t able to take home the top prize, I couldn’t be more proud of this year’s team. 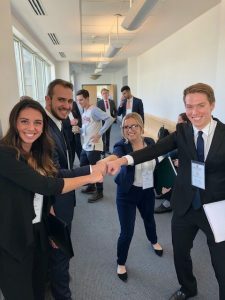 They worked extremely hard in the weeks leading up to the competition and they ended up representing MSU extraordinarily well,” said Justin Lawrence, the team’s coach and an assistant professor of marketing in the Eli Broad College of Business. The Spartan team consisted of all sales minors: Rachel Carle, Nicolle Brennan, Ross Manssur (all communications majors and sales leadership minors), and Evan Farough (applied engineering science major, technical sales minor). The sales leadership minor is a collaboration between the Broad College and the College of Communication Arts & Sciences. The quartet was selected following a role playing-based audition. The Spartan team was chosen for the top three after winning its eight-team group after two rounds of sales appointments, Brennan said. “We really could not have done as well as we did without Justin as our coach,” she said. 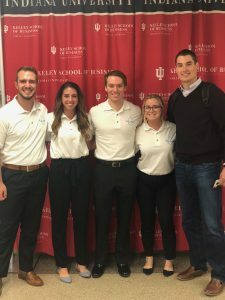 The NTSC, held at IU’s Kelley School of Business, is considered the nation’s premier sales competition, challenging students from some of the top-ranked business schools across the United States to take their in-class learning and apply those skills to realistic selling situations. An MSU team won last year’s competition. “This is another outstanding accomplishment for our program, and is representative of the great talent and work ethic of our students and the quality of instruction they receive here at MSU,” said Douglas E. Hughes, chairperson of the Department of Marketing and United Shore Faculty Fellow in Sales Leadership.